We have learned something about ourselves and the people in the U.S. 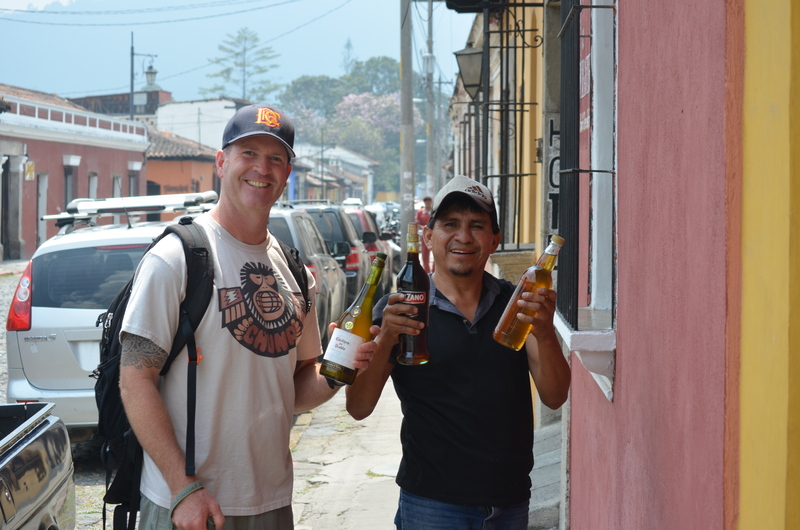 It happened after spending two months in Mexico, a couple weeks in Guatemala and traveling further into Central America. It happened while watching every day life for every day people in the big towns and in the small villages in these countries. 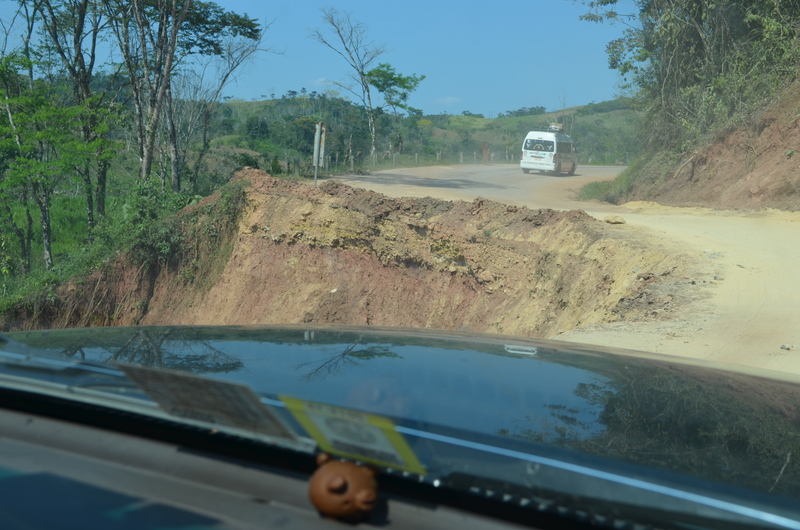 No warning that the road is missing. It happened while driving down a paved highway through the hard rain and getting passed by a motorcycle that was made for one but carried five; dad in the front holding the handlebars and squinting through the downpour, brother in the middle gripping a plastic container filled with chips, baby sister sandwiched between dad and her brother, and mom in the back with a baby slung over her arm holding everyone together like a bookend. And of course, no helmets. It happened one day while driving on the highway through Mexico and passing a car with every seat occupied included the tight area between the seats. Arms hanging out of the windows for extra space, a wheel that looked flat, and a baby tucked carefully on top of the dashboard. 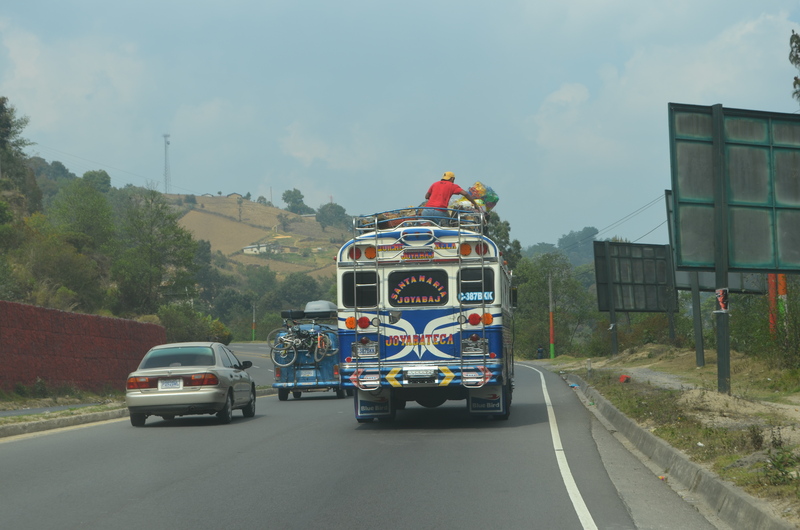 It happened when we witnessed the famous “chicken buses” in Guatemala that are old U.S. school buses revived and revamped uniquely painted and decorated with flash. Everything and everyone can ride on the bus – including animals, luggage, bikes, crates, stacks of wood, buckets of goods…and chickens. When the seats are filled, people climb to the luggage rack on top and hold on tight. 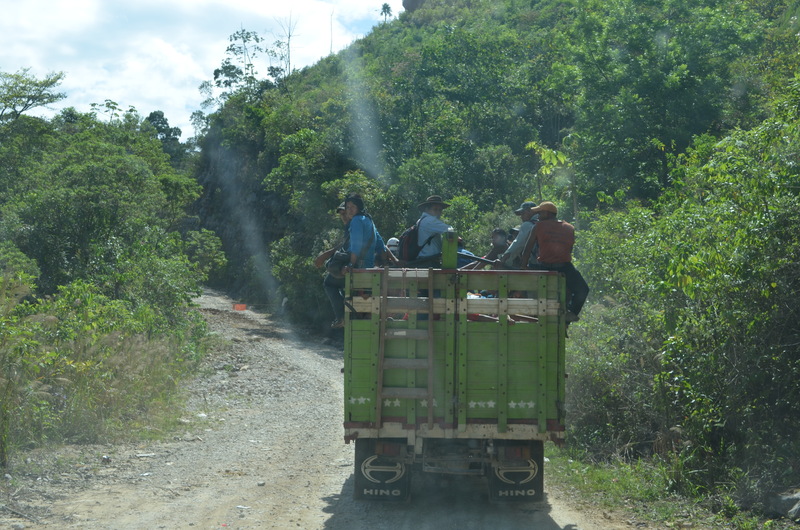 It happened on the worst roads in the western highlands of Guatemala when we followed trucks with added racks and people hanging from every bar. Bouncing over pot holes and cracked pieces of pavement. Some chatting on cell phones. Not a worry in the world. 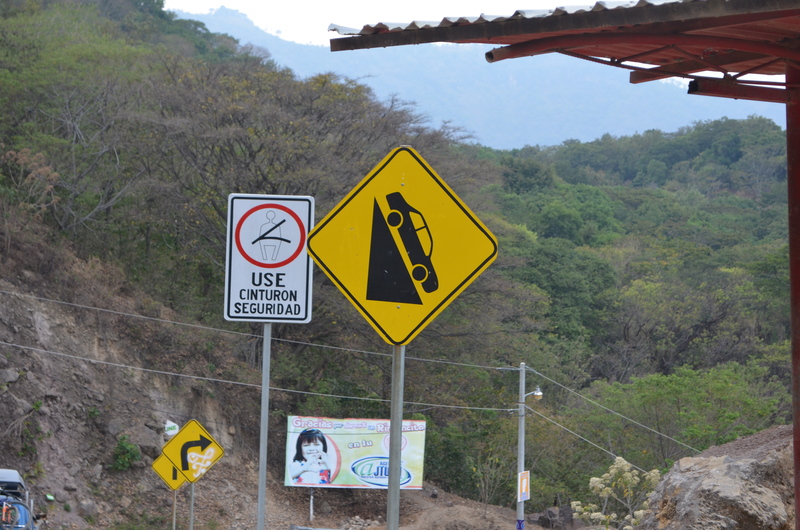 Just to let you know…this one is going to be steep. It happened while roaming the aisles at the super market to see unrefrigerated bins full of raw chicken. You just grab a bag and take what you need. Colin buys street honey. Sold in old wine bottles. It happened while watching families clear fields. Young kids whacking weeds with machetes while standing inches from one another. If this was my family, the day would end with a field still full of weeds and someone on the way to the emergency room. It really happened the day we saw another family on a scooter, but this time they were cruising through town over cobble stone streets while dad was zipping around other cars, trucks and pedestrians his daughter was squished in the middle tucked next to mom, who cradled a baby in her arms while breastfeeding. Talk about multi-tasking! And still, no helmets. All this happened while we were carefully driving under the speed limit, strapped in our seat belts, wearing prescription eyeglasses with stashes of hand sanitizer placed all around the truck…when we realized Americans have gotten soft. We have no stomach for danger. We are too careful, too fearful, and too worried. We are scared our kids will get hurt or bring home germs. We are nervous about Ebola and watch the news to see where it strikes next. We wonder about our place in the world and worry if we are smart enough, wealthy enough and strong enough. We don’t want scratches on our cars or gray hairs on our heads or wrinkles around our eyes. We are too busy, too stressed, too preoccupied. Well said, Colin. My next trip to Baja, I’m getting rid of my spare tires, tool box, spare gas cans, and road maps. 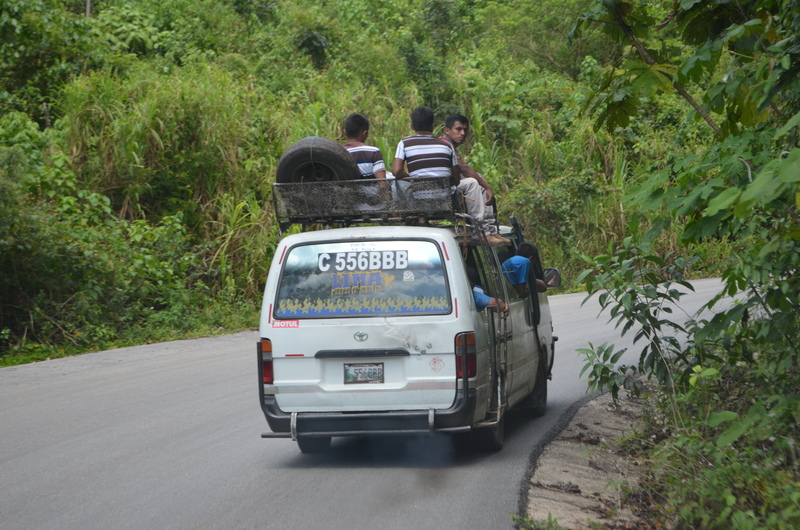 Seriously, though, to most norte americanos, living on the edge is not having cell service. I’m enjoying your posts- keep it up and buena suerte. Larry! Don’t leave the spare tires just yet…and extra foam pieces, because you never know when someone will beed them. I heard you picked up a little friend along the way. What is that sweet pup’s name? Good to hear from you. You’ve really hit a nerve there. Here in the DC area, Montgomery County police are arresting parents for letting their kids walk home from the park alone. The parents say they belong the the “Free Range Parents” movement. The kids are fine until the cops scare them and then take them to Child Protective Services and hold them for hours, threatening the parents with losing custody if they persist in this reckless behavior! I’m of the generation where all of us were free-range, and my kids were too. The rest of the world would be entirely puzzled, no? Christa, I really hope the practice of arresting parents for letting their kids walk home alone doesn’t take off! I grew up with parents who said things like, “what did you think was going to happen” when we came home crying about something we did (and knew better). Learning from our own actions…what a concept! Beautiful, Carrie and Colin. Once again you did it! lovely job, amazing trip! Dad, I agree! We are always the first in line to help others in need. True dat. Same in Canada. So true-of New Zealand too, by the way, we’re marginally less health and safety obsessed than the US in some ways, but more so in others. Latin America is proving to be a refreshing change. Love this post! We met ya’ll on the Natchez Trace near Natchez in a State Park. We’re followed your adventures and are amazed. We’ve also prayed for your traveling safety and protection. The post is by far the most enlightening, as well as the replies/comments related. What an awesome (God-given) privilege to be born in America, the land of the free! You two have awesome written communication skills…perhaps one of you…or both of you, should change your vocation when your return from this awesome adventure of a lifetime. You certainly have more to say than these posts. We enjoy them tremendously!!! Ed and Pat! We think about the two of you often and our time at Natchez. (You know we still haven’t come across one of those collapsable coffee pour over things!) Thank you for taking the time to read and respond. We love hearing from folks we have met on the road. we hope your trip back home went smooth and fun! We are very fortunate to live in the US…we realize this more and more as we travel. Keep in touch!